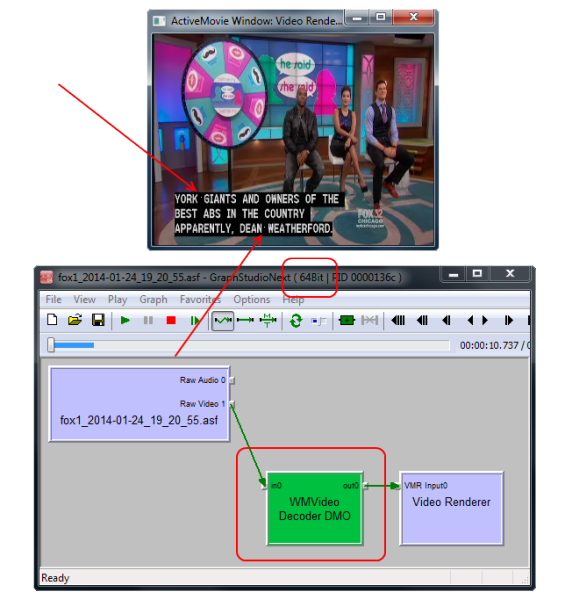 Unfortunately, 64-bit version of Windows Media Video 9 Decoder is not as good as its 32-bit sister. 32-bit version is user an order of magnitude more frequently and does not give troubles, nevertheless 64-bit version offers similar feature set it is pretty hard to see it in action since it takes a 64-bit media application to host it and most of media applications are 32-bit (there is often a good reason for this), and even Windows SDK 7.0 topoedit comes pre-built as Win32 application only (provided with source code though, so one can built x64 peer – after fixing buildability issues and adding x64 configuration manually). Decoder is available as dual DMO/MFT which enabled it for both DirectShow and Media Foundation APIs and similarly exposes the problem in both as well. Once in a while, 64-bit version of the decoder might be producing incorrect output, adding white dots where they are not supposed to be. The only exception is DXVA-accelerated decoding where bug is worked around by hardware assisted decoding and the output is correct. One of the ways to easily see and reproduce the problem in action is to re-encode the content in 64-bit version of GraphEdit into anything else: video decoder there will decode in software and burn the artifacts in.